Veteran of "HQ" Battery 1/83rd Artillery 1967-1968. Mr. Bruce Tetsuo Taiji, age 69 of Columbia, TN passed away June 20, 2016 at his home. 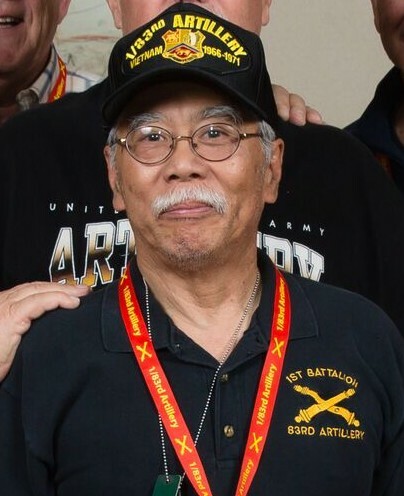 He was a 39-year veteran of the U.S. Army. After service he continued to attend the annual Army Warrant Officer meetings across the country. He also enjoyed dirt track racing and was a kind hearted person with a good sense of humor. Preceded in death by parents, Masami and Umeko Kawakami Taiji; brother, Bryan Taiji. He leaves behind his loving wife, Susan Taiji; son, Darryl Taiji; daughters, Annette (Josh) Zumudio, Jennifer (Chris) Cormier and Jessica Taiji; sisters, Kathleen (Rich) Craig and Margaret (Doug) Fujii; grandchildren, Riley Sims, Becca Zumudio, Joan and Gabriella Cormier. Memorial services with full military honors will be held at 4:00PM on Tuesday, July 5, 2016 at Spring Hill Memorial Funeral Home. Memorials may be made to the American Cancer Society. To leave a message of sympathy, click here. Here is a video tribute to Bruce (courtesy Spring Hill Funeral Home).